In years to come it is entirely possible that the world will view Nelson Mandela as one of the greatest men who ever lived. He led the people of South Africa to freedom from tyranny and then, through the virtues of tolerance and forgiveness, won over his persecutors and created a society in which both white and black prosper. Before Mandela, black people were not allowed to own companies, so without him our company would not even exist. In the world before Mandela it would have been inconceivable that black people could own and run a major investment house. Mandela made it possible. Three Safika directors and former shareholder, the late Soto Ndukwana, fought side-by-side with Mandela for freedom and were imprisoned with him on Robben Island; Moss Ngoasheng served seven years, Saki and Soto served five years and Richard served 11 years. Mandela mentored Saki and Moss during their imprisonment and both acknowledge the huge debt they owe him for his moral and political guidance. “It was Madiba’s personal intervention that led me to become an economist, which in turn led to me becoming Safika’s chief executive,” says Moss. He recalls: “While I was in prison, I went to see Madiba to tell him that I wanted to study politics. He shook his head and said; ‘why don’t you study economics instead; in the future we are going to need men like you to be our economists’.” Then the great man handed Moss his personal Economics 101 notebook and told him to get started. 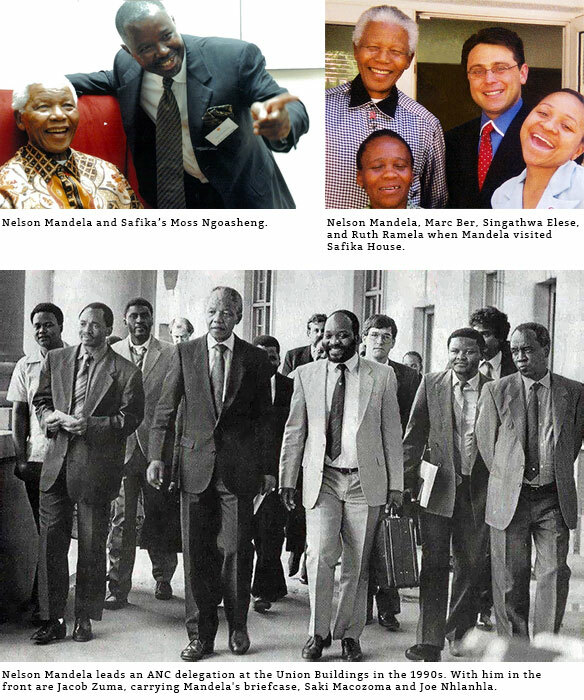 Saki Macozoma recalls his first meeting with Madiba: “Meeting Nelson Mandela in November 1977 was like the epiphany on the road to Damascus for a young adult like me. I was young and angry. He was wise and caring. I had no idea that less than fifteen years later I would be writing speeches for a free Mandela and participating with him in the unfolding of a great historical moment, freedom for South Africa. We at Safika like to think that we honour Mandela by living as he would like us to do. We have built a flourishing business that we use to develop South Africa for the benefit of its people. We are investors in and responsible for multi-billion rand ventures that provide employment, bring tax revenues to the country and add to our country’s international reputation. Everything we do in business is possible only because Nelson Mandela and his comrades made it possible. Safika owes another debt to Madiba; we learned our ethics on Robben Island taught to us directly by Mandela. He taught us not to dwell on the wrongs of the past but instead to focus on building the kind of society we would be happy to live in. Safika follows Madiba’s moral guidance; we will have no truck with corruption, we are honest in our dealings and we are always aware that our number one priority is help make South Africa economically stronger, in a way that benefits the people. Thank you Madiba from all of us. TWO of South Africa’s banks will soon inform the market of their decisions to appoint new chairmen to their respective boards. Investec and Standard Bank Group are likely to have their board chairmen retire late next year and they will most likely step down officially not later than their annual general meetings in early 2015. Click here to read the full article on Business Day Live. The rising property market has created an opportunity for boutique fund managers handling the investment capital of some of Australia’s wealthiest families and individuals. Specialists like Wingate group, Qualitas and Alceon are packing mezzanine funding for property developers at rates of around 20 per cent. But for many developers a small mezzanine injection for a quick turnover makes sense, even a higher rates. The money, in equity or subordinated debt, frees up capital to allow the pipeline of projects to grow, and it is often quicker and easier to obtain than bank finance. Banks which require that developers put in as much as 30 per cent equity in a project, are also showing a greater willingness to structure deals that include a portion of mezzanine debt. Its most high-profile deal was a joint venture with JPMorgan to provide a $40 million mezzanine loan to the Plenary group and Colonial First State Retail property Trust (CFS), to fund their acquisition of the South Wharf DFO in December 2010. “We’re not a lender of last resort, we’re never lost money on a deal,” said Ryan Levin, who managers Wingate’s Property division alongside Mark Harrison. The Statement acknowledges the stigma that has been attached to this form of high-interest lending in the past, and has resulted in developers staying reticent about their use of these fill-in loans. ‘We act as capital partners with developers. Sometimes we co-invest as equity partners and other times we provide mezzanine financing. We don’t do many one-off deals and we only work with developers with a proven track record,” Mr Levin told the Australian Financial Review. Wingate provides developers with short-term loans ranging from $3 million to $20 million at interest rates of around 20 per cent. The loans cover the length of the project plus a bit of time after to allow for settlement of contracts. Wingate focuses on medium-density projects in inner suburban locations that are well serviced with infrastructure. “We stay out of higher density high—rise, which comes with greater risk,” Mr Levin said. Tim Johansen, managing director of Qualitas real estate finance, said sophisticated developers were increasingly looking for third party capital to assist with their capital management given how capital intensive development financing had become. Using like-minded capital partners to invest in projects enables developers to diversify their scare capital across a number of projects,” Mr Johansen said. Qualitas lending rates are determined by level of risk (pre-sales, level of equity, location, unit sizes, construction) with interest rates offered between 16 per cent and 19 per cent. “This is a cheaper form of capital for a developer who will generally expect a 35 per cent plus integral rate of return on their own equity,” he said. He added that the major banks were in tune with “credible developers” using partnering capital in the form of mezzanine debt. “The market is all about this approach at the moment, rather than pre-GFC days of just leveraging deals to ensure the developer was laying off all of their financial risk,” he said. The banks are comforted that there is somebody else is in the business with their own skin in the game,” he said. Alceon started up in early 2010, with Mr Loewensohn spotted a gap for funding in between developers’ own equity and what the banks were willing to lend. Since the GFC, banks are lending a lot less, he said. Alceon also provides advice to companies, such as for mergers, acquisitions capital raisings and floats. According to Mr Loewensohn, subordinated debt is also good for the developer because a package deal might mean in some cases a borrower pays less interest overall. The bank typically lends a higher amount than the equity put in by groups such as Alceon or Wingate. So even though a mezzanine financier chargers a higher interest, overall it can end up cheaper if the bank lowers its interest rate by a percentage point. We are providing what they don’t want to or can’t, and moving them into a position where they can,” Mr Loewensohn said. PPC, South Africa’s largest cement maker, has entered an agreement to purchase a controlling stake in Safika Cement Holdings for about R350-million in cash. Safika Cement is a blended cement producer that produces more than 20-million bags a year. It owns five blending facilities and one milling operation, and produces blended 32.5N cement under three brands — IDM Best Build, Castle and the Spar Build-It house brand. The proposed Safika transaction is subject to approval by the regulatory authorities as well as the conclusion of the due diligence process. Employment Company Kelly Group posted a return to profit in the six months ended March, sending its share price 2.7% higher to R1.90.